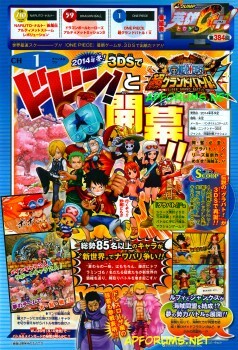 This week Jump issue announced One Piece: Super Grand Battle! for Nintendo 3DS. Yes! I love the Grand Battle games. Considering Romance Dawn and Unlimited World Red made it over....one can only hope this means more OP games will get released across seas. this will absolutely be mine. Last edited by rayleigh92; July 23rd, 2014 at 11:44 AM. Give me a story mode like Grand Adventure's and I'll buy immediately. I think the full name is Super Grand Battle X. Did Capcom develop this game? Damn you Nintendo! Why couldn't you have made the 3DS region free? I'm not sure yet if they are going with Gigant Battle's design (proportional) or if they are going with Grand Battle's design (big head); I would like the first one more. Anyway, kinda excited to see how they are coming with it. I can't help but think that Ganbarion should've waited for 2015, so that they could throw in more characters, since we already have a Dressrosa based stage on Unlimited Red R...but, well, the more the better. Awesome news. I'm kinda confident it will come to Europe one day. I hope it plays like Gigant Battle with a few improvements. From the look of it, we already have 14 playable characters 99% confirmed (9 SH + Dofla + Ace + Fuji + Shanks + Law). I can spot Barto in the scan but he looks like a support character in that screenshot. Last edited by fana; July 24th, 2014 at 10:28 AM. Balloon Head Doffy vs Gorilla Doffy. It looks more like the PS1 Grand Battle games than the PS2 ones. So more of a Smash Bros than a Powerstone. Seems pretty cool. So is it more a grand battle or a gigant battle? Or are they both the same gameplay wise as i only played the gigant series. Really hope this comes over here seeing as gigant 2 didn't. but with all the recent one piece games it is more likely. Just realised that Elizabello is on the background in the Colisseum. A King Punch stage hazard ?